The pizza place where we buy our pizzas when we are too lazy to make them has a pretty tasty nacho pizza that Luke occasionally opts for, so I suggested we make our own version of it for pizza sunday. 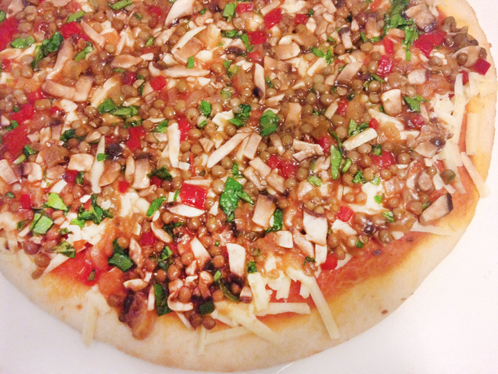 It is just topped with corn chips, so we put our own spin on it and it made it a little differently. For our nacho pizza we sprinkled a small amount of cheese on the base, and spread our simple nacho mix to cover the base. 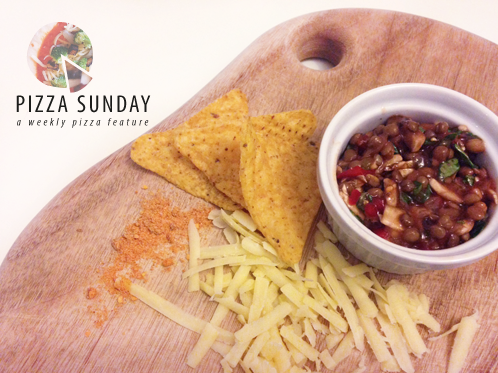 Our nacho mix was taco sauce, tabasco sauce, mexican spice, lentils, capsicum, mushrooms and baby spinach diced finely. We put the pizza in the oven just like that and in the last ten minutes or so of baking, we pulled the pizza out and sprinkled crushed up corn chip pieces & the top layer of cheese over the pizza. The corn chips were crushed up into smaller 1cm pieces, so they weren't too small. 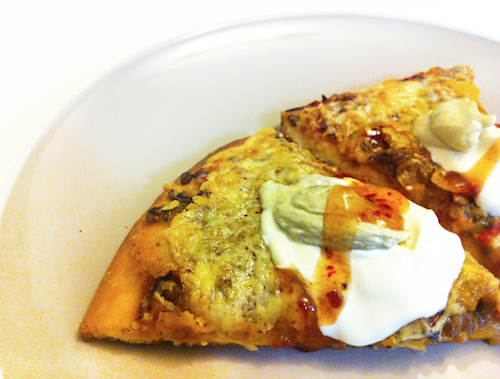 We then topped our pizza with sour cream, guacamole & sweet chilli. Fresh avocado pieces would have been much better, but like always the Coles near our house never has anything so we weren't able to buy any fresh avocados today. Our version of nacho pizza is definitely one of my favourite pizzas we have made, with our balsamic pizza being a close second. Pretty creative and looks so yummy!